In the past years, aquaculture industry has developed with great speed, which has also given rise to the wide applications of aquatic feed industry. Specially designed for aquatic animal breeding, aqua feed can be divided into fish feed, shrimp feed and crab feed according to feeding varieties, divided into pelleted feed and extruded feed on the basis of production process, and divided into mixed feed, concentrated feed and premixed feed in the light of fodder features. The raw materials of aquatic feed are mainly constituted of fish meal, cereal materials and grease, thereinto the previous two always account for over 50% of feed cost. 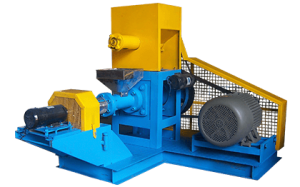 Because fish have small intestines and stomach, lack of good digestion and absorption ability, the requirements on processing technique of fish feed are far higher than that of livestock feed, so it’s particularly important to choose suitable fish feed making machine and process. 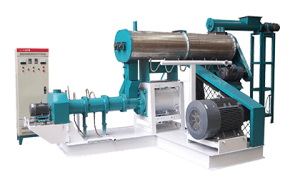 As is well known, aquatic feed production development has been through several phases, including hand feeding process, cold forming of moist diets, pelleting presses via pellet milling technique and extrusion technology via feed extruder. Currently, pellet feed and extruded feed have become two main popular fish feed due to the profits they bring for fish farmers. 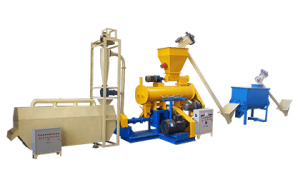 Here, FANWAY, as the pioneer of various fish feed machines professional manufacturer, will discuss the respective manufacturing processes, advantages and disadvantages of both pelleted fish feed and extruded fish feed. With the development of processing craft, fish feed can be produced as pelleted feed and extruded aqua feed. Compared with natural feed, they have higher density and less humidity, not only allowing for long time reserve but decreasing the isolation of raw and processed materials. Although these two aquatic feeds have the same ingredients, there are obvious differences after put into water: pelleted feed sinks in water bottom while extruded feed floats on water within certain time due to their physical characteristics. Even if with the same formula, the cost of extruded aqua feed is higher than that of pelleted feed, but extruded feed can still create more benefits in virtue of its remarkable advantages. The principle of choosing raw material is to select the lowest cost in the premise of ensuring that feed contains the required nutrient substances. In addition, choosing materials should be based on the upper limit and lower limit dosage of ingredients probably used as raw materials, stipulating the upper limit dosage of materials with natural toxins and the lower limit dosage of some materials so as to improve the palatability and water stability of fish feed. For instance, feed producers should control the floor level of rice vermicelli processing by-products and other starch-type materials in order to promote the cohesiveness and stability in water of feed pellets while providing energy. Besides, the thinner the particle size of raw materials, the higher the digestive utilization ratio, and the better the cohesiveness and water stability of fish feed. Remember to dilute and add the mineral premix compound before crushing and the vitamin premix compound after crushing step by step. As to their manufacturing processes, FANWAY concludes as the following figure shows. Clearly, the difference between these two aquatic feed is the third step, that is, pelleted feed mainly uses pelleting mill technique while extruded feed chiefly adopts extrusion technology via high-performance fish feed extruder. In contrast, the processing craft of extruded fish feed is more complicated. As far as production is concerned, pelleted feed has a series of advantages, such as low cost investment, high yield, low unit production charge, fast capital return and so on. Moreover, compared with natural food and unprocessed grain feed, pelleted feeds via pelleting press are easier to store, package and transport. For fish farmers, pelleted feed has low price but high feed coefficient, which not only makes major cultured fish (like grass carp, crucian and cyprinoid, etc.) grow well but also bring mixed culture fish (like silver carp and dace, etc.) good growth. feed cost as well. Meanwhile, lots of nutrients are dissolved under water, resulting in the lower of mixed feed original quality, all of which have become the prominent problems at the aspect of aquatic feed technology. Nowadays, extruding technology is very common and widely used in producing kinds of feed. In fact, various fishes should be fed according to feeding habits of different fishes, broadly separated into three categories – floating, sinking and slow sinking, and feed should stay in water completely for certain time so as to fish have enough time to eat. For now, only by using extruding technology can achieve the above features. With the incomparable superiority, the extruded fish feed has low pollution, high efficiency, high conversion, playing a vital role in the improvement of digestive utilization ratio. During extruding process, heat, humidity, pressure and various mechanism actions can enhance the starch gelatinization degree, damage and soften the cell wall fraction of fiber structure and release some begirt digestible substance, thus boosting the digestion and utilization. During extruding process, moderate heat treatment can passivate some proteinase inhibitor (like antitryptase or urease), eliminate the side effect, kill harmful germs in raw materials and change the property of protein molecule to increase contact with enzyme in fish body, which makes feed easier for fish to digest. Extruded feed can lower the content of cottonseed and gossypol dramatically, bringing better detoxification effect. Meanwhile, its long time stability in water, up to 12-36hours, makes it convenient to observe and control fish feeding. Certainly, there are always two faces to everything, and it’s without exception for extruded aquatic feed. Although extruded aquatic feed has distinct preponderance than pelleted aqua feed and its manufacturing process gains acceptance from lots of feed plants, its initial investment of production line is much larger, which also scares many feed enterprises or fish farmers. The option of aquatic feed should consider the feeding characteristics and habits of different aquatic livestock. For instance, river crab and other benthic animals are accustomed to search food in water bottom and eat food very slow, so aquatic feed for them cannot be too hard, and the loss of fragment caused by biting food should be reduced as far as possible. Then extruded sinking feed would be a better choice because it is convenient to soften and suitable to gnaw, reducing feed waste and water pollution with less fragment loss. Moreover, extruded aquatic feed has long water resistant time and high cultivated degree. Additionally, when the aquatic products market condition is well, using high-class pelleted feed or extruded feed can fatten fish quickly for selling on market as soon as possible. Feeding with those aquatic feed cannot only lower the occurrence rate of fish disease and make fish taste better, but also decrease waste of resources under the condition of fishing resources starvation day by day. However, using extruded feed through whole feeding process can also lead to feed/meat ratio rising, bad sensitivity and intolerant for long distance transport. In adult fish phase, still continuing to use extruded fish feed can cause fish guano, big fish tripe and high moisture content in body so that customers are not willing to purchase. In a word, during the process of fresh water aquaculture, the mixed using of pelleted feed and extruded feed can not only regulate water quality and reduce fish feed waste, but also improve the output of aquatic products, achieving the perfect combination of water quality control and economic benefits. Therefore, the combination of pelleted feed and extruded feed is the most significant feeding mode deserving to promote so far.